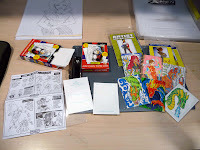 As I continue to try the pre-made Artist Trading Cards (ATC) blank packs available commercially, I picked up a couple of Canson Fanboy Comic & Manga Trading Cards boxes on my last visit to the Jerry's Artarama store in Miami. Each box contains 20 cards (2.5" x 3.5" 150 lb/250 gsm acid free paper) with their protective sleeves. A two-sided instructional sheet is included in each box. One side is printed in French and the other in English. 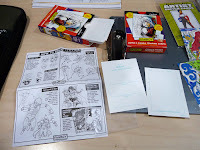 It is more of a quick primer and a bit of inspiration to get a budding manga artist started. The front and back of each card is printed with non-repro blue grids for framing miniature art and recording the name of the artist and contact info. 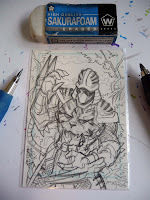 Used the Prismacolor Archival Illustration Markers with a chisel, 03, and 005 nibs to ink a ninja character on the blank Canson Fanboy manga card. 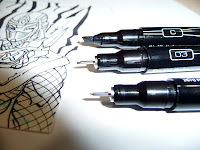 For a tighter cleaner image, it would be better to draw the coloring outline first with pencil, ink it, and then erase any remaining pencil marks that are still visible. The Prismacolor 005 pen nib is quite delicate and bends rather easily under my normal drawing pressure. Thus, I had to periodically rotate the pen to bend it back to its original shape. I should probably stick to the 03 nib as my smallest regular pen nib, but all of them feature a steady ink flow and smooth performance on all the ATC stock tested. Even the bent nib retained its functionality throughout the test, but I would not expect the 005 nib pen to last as long as the larger nibs in the long run. Already decided not to get the 005 eight color set because of this experience. 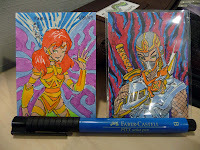 Couple of finished cards drawn on Canson Fanboy manga paper. Once in its protective plastic sleeve, the card is a tad more difficult to photograph. Not really happy with how this mermaid card turn out on the Blue Line stock. Yellow was not a particular good choice for rendering shadow areas of skin tones. Faber Castell Pitt Artist pens can be difficult to blend and apply evenly. I actually prefer the uncolored stage of this particular example. Selecting the colors more carefully and working from light to dark hues resulted in the cleaner image of this dragon sketch card drawn on smooth Strathmore 300 Bristol board. The small size of the ATC format allows for their design and completion in a short time with very few tools almost anywhere. Managed to do a few of these sample cards while waiting at the hospital and auto shop. Using the thickest pen nib, 08, to outline the figure and separate it from the background more clearly. 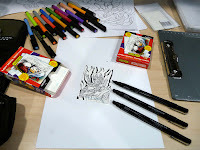 Sketching with the Prismacolor Archival Illustration Markers to create waterproof coloring outlines and coloring them with the water-based Faber Castell Pitt Artist pens is a pretty effective combination of art materials. Finished custom manga set of ATC in their protective sleeves. The Canson paper readily accepted H and & 7B graphite marks and erased fairly easily without damage to its surface . 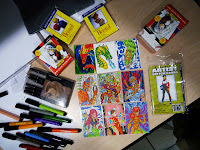 A pack of Canson Fanboy Comic & Manga Trading Cards is quite a suitable addition for a field sketching kit. 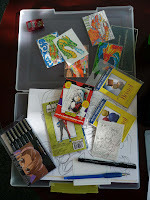 Its compact size and performance works well while on-the-go with a variety of drawing and coloring tools. 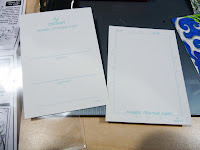 The box of 20 cards with their sleeves is often priced quite competitively for 2-4 bucks, so it can be a pretty efficient option for when you lack the time to cut your own ATC cards.